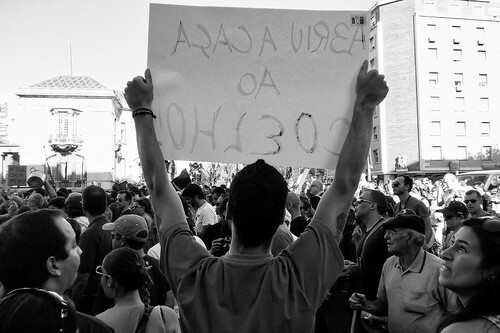 Since the period that followed the end of dictatorship in Portugal in 1974, there hasn't been such wide participation in a protest [en] as September 15's massive anti-austerity mobilization ‘Screw the troika! We want our lives‘ (Que se lixe a troika! Queremos as nossas vidas) [en]. 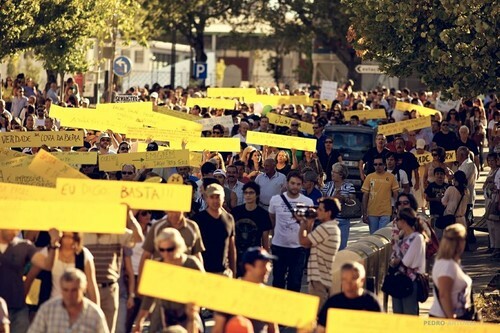 Between 660,000 and 1 million people of all ages took to the streets in more than 40 cities throughout the country and abroad, booing the government, the troika [of inspectors from the European Commission, the European Central Bank and the International Monetary Fund], the inequity, the growing unemployment and impoverishment and the lack of justice and opportunities for all. Social networks have been abuzz, with the hashtags #15sPT and #QueSeLixeATroika still being used on Twitter. The blog O que diz a rua (What the street says) gathers a vast set of crowdsourced photos and videos of the protests that are used to illustrate this post. The figures show how an increasing proportion of the population of this country of roughly 10 million is discontented with the measures imposed by the government and the troika to address the public debt. 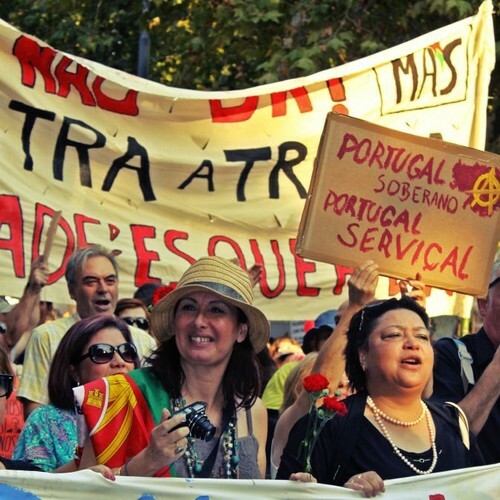 On September 7, Prime Minister Pedro Passos Coelho had announced more austerity measures to be implemented in 2013, which will visibly worsen the impact of debt in the pockets and accounts of both public and private workers. 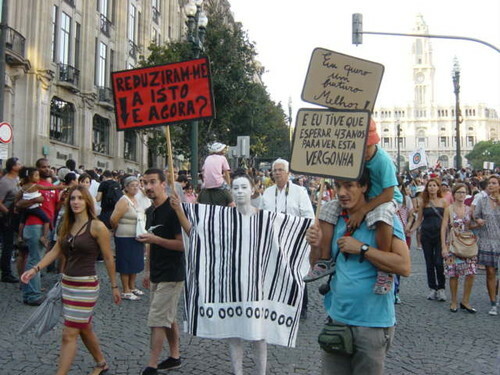 Whereas the scale of the protests is a sound and clear sign that people reject those measures, the coming weeks are expected to bring more developments in the political arena, with President Cavaco Silva having called a State Council meeting next Friday, September 21, while the state budget for 2013 is expected to be voted on in parliament on October 15. 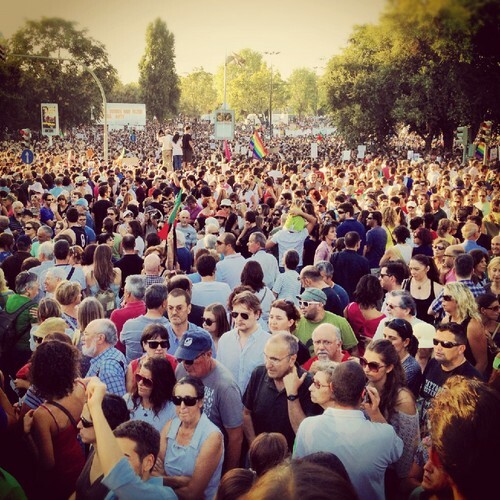 Meanwhile, citizens are using their blogs to reflect on the momentum that the protests have brought, and writing about possible paths for strengthening citizenship. só é possível derrotar a austeridade com propostas alternativas credíveis. (…) a convergência dos que se opõem à austeridade não se faz com apelos, faz-se com a demonstração prática de que há mais coisas que os unem do que as que os separam. it is only possible to defeat austerity with credible alternative proposals. (…) the convergence of those who are opposed to austerity should not be accomplished with calls, but with the practical demonstration that there are more things which unite them rather than separate them. O início de uma mudança efectiva deveria partir tão simplesmente de um convite para que todos passassem a sair à rua -todos- os Sábados, sem agenda, tão somente para re-inventar o espaço público (geográfico, social e afectivo) de forma intuitiva e generativa, infinitamente múltipla. Falando com estranhos, ampliando o micro-debate, descobrindo semelhanças, diferenças, pontes, barreiras, contrastes e conciliações. Cuidando a longo prazo de um tecido social vivo, activo, auto-regenerador. The beginning of an effective change should start as simply as from an invitation for everyone to start going to the streets -every- Saturday, without an agenda, only to re-invent the public space (geographical, social and affective) in an intuitive and generative way, infinitely multiple. Talking with strangers, amplifying micro-debate, finding similarities, differences, bridges, obstacles, contrasts and conciliation. Nurturing in the long term a living, active, self-regenerating social tissue. Whatever comes out of this, the Portuguese did demonstrate they CAN STAND UP! The above celebration [en] comes from the other side of the world, New Zealand, where Rita Bento Allpress, a PhD researcher and one of the more than one hundred thousand Portuguese people who leave the country every year, followed the protests from early Sunday morning via Twitter. Meanwhile more protests and actions are scheduled for the next days and weeks, and many are being organized on Facebook, as an article on P3 informs.